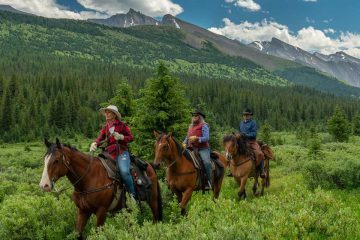 Hop in the saddle and explore the deep, wild forests of Banff. Our experienced guides make this tent trip easy and comfortable, so you can relax and focus on the jaw-dropping scenery around you. When night falls you’ll be warm and cozy as you curl up in your A-frame canvas tent, set on a raised wooden platform. Listen to the gentle hush of the forest as you fall asleep. 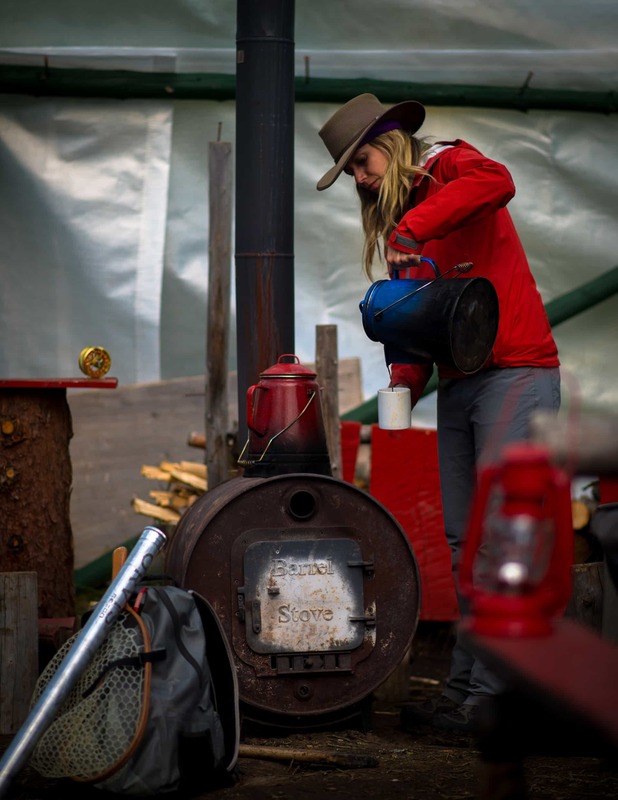 In the morning you’ll have a wash stand with hot water for freshening up and a hearty, homemade meal prepared for you in the kitchen tent – the perfect fuel to give you energy for a day on the trail. Plus, as you ride down the spectacular trails your guide will weave entertaining tales of the history of Canada’s rugged backcountry and what it was like to live and work in the great Canadian west. You’ll also learn about the diverse wild creatures that call this unspoiled mountain paradise home. A separate string of mules will safely deliver your belongings to the camp for you so that you can ride unencumbered. When you arrive at camp, your “duffel” will be waiting for you so that you can grab it and settle into your tent. Be sure to check the “What to Bring” section of our website when packing your bag. 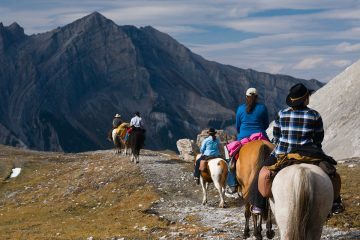 Once you’re all checked in, we will take you by van to the very fringe of the frontcountry, the trailhead corral at Lake Minnewanka to meet your friendly guide and the trusty horse we’ve specially chosen for you. 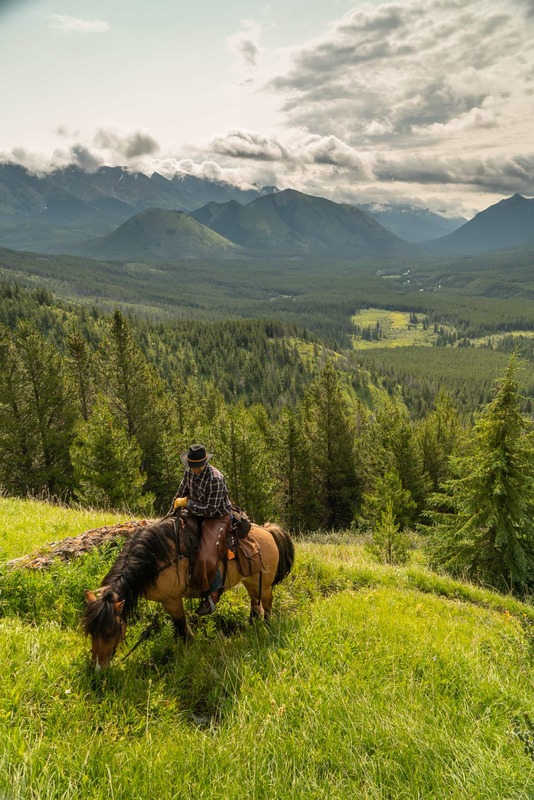 This is the launching point to heading completely off the beaten track into Banff’s wildest places that most tourists will not get to see, and our first ride gives you the chance to settle into your saddle and start to bond with your horse. One of the aspects of these tours that guests often rave about is the connection they forge with their hooved companions. At the end of the trip, you’ll have a new four legged best friend. 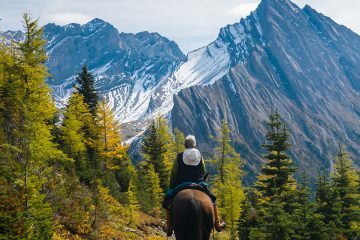 You’ll learn to “trust your horse” (a Banff Trail Riders catchphrase) as these sure-footed beasts carry you safely down even the most difficult backcountry trails. We will cook up a feast of hearty, homemade cowboy cuisine and gather around in the main kitchen tent, which acts as the communal hub of the camp. In the evening, we will gather around a crackling fire to watch the stars and share stories. Then, it’s time to curl up in your sleeping bag in your canvas tent with cot, heater and thermarest and get some sleep – the adventure has only just begun. After breakfast you’ll mount up in the fresh morning air and ride the 10 miles to Flint’s Park Camp, with a stop for lunch on the banks of Cascade River. 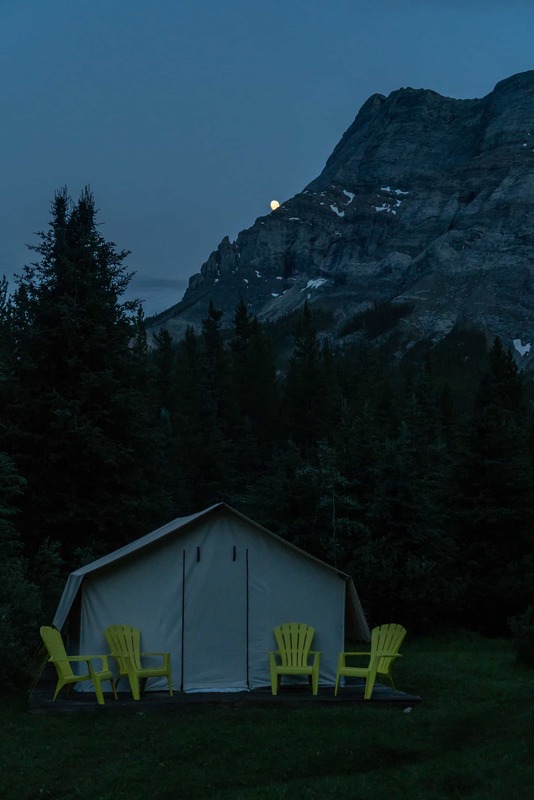 This stunning camp is one of the highlights of the trip, located in the fertile valley bottom with an open, grassy ridge providing sweeping views of the awe-inspiring Rocky Mountains. This camp is the jumping off point for many different rides into the backcountry, each more spectacular than the last. Your guide will create a customized ride for your group, tailored to your interests and experience. This ensures that your adventure is a bespoke, VIP experience that is just right for you. At the end of the day you’ll return to the familiar camp to relax and chat around the campfire once more. On our last morning at Flint’s Camp it’s time to say goodbye to this stunning campsite but the trip is far from over! Once saddled up, you’ll ride 10 miles along a different river trail route on your return to Stoney Camp, stopping for lunch stop for lunch on the banks of Cascade River. You’ll settle back into this familiar campsite, marvelling at how much you have seen and experienced in the few days since your first night here. Arise early and say goodbye to your pristine backcountry surroundings – it’s time to head back into Banff and rejoin civilisation. Most of our guests are reluctant to leave the isolated, tranquil beauty of this off-the-beaten-track spot. On the last day of your Rocky Mountain backcountry adventure, you’ll mount up for the 13 mile ride through the stunning scenery of Elk Lake Summit which is a highlight of the trip for many. The climb to Elk Lake Summit is jaw-dropping, you’ll be wide-eyed with awe at the larger-than-life mountains with their jagged edges piercing the sky. This is a truly exciting and epic ride and it’s also a chance to reflect on everything you have experienced in the last 6 days. You’ll have plenty of wild Banff backcountry stories to tell and you will have earned the bragging rights to say that you spent 6 days deep in the Canadian Rockies. 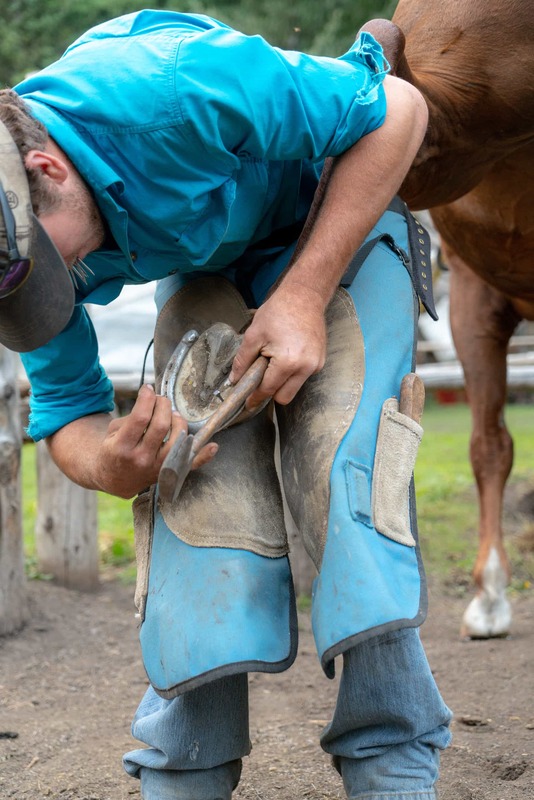 The shuttle will be waiting at the Norquay Corral end point to take you back to Warner Stables for approximately 5:30pm to 6pm, where you’ll say goodbye to the new friends with whom you shared this unforgettable adventure into the wild. The six-day tour commences at 8:30am at the Warner Stables on Mondays and Fridays. The ride returns to the stables between 5:30pm and 6pm on the sixth day. The tour includes five nights accommodation (two nights at Stoney Camp and three nights at Flints Camp) and a fully catered menu. Please arrive at 8:30am on the morning of your tour (please do not arrive any earlier than 8:30am). A detailed list will be provided in your booking confirmation of all items that you should bring with you, but you can also take a look at the list of items here. Each campsite has six A-frame canvas tents set on a raised wooden platform. Each tent has two single cots and a stove. All camps are fully catered and include live-in cooks, who all love to show off their backcountry culinary skills. Gather inside the big kitchen tent to dine on succulent steak or chicken. There’s plenty of table space inside too, including room for card games when the sun goes down. Each campsite is surrounded by an electric fence that keeps curious critters out and there are meticulously cleaned outhouses. Crystal clear water is supplied by nearby glacial streams, which is then filtered for drinking.